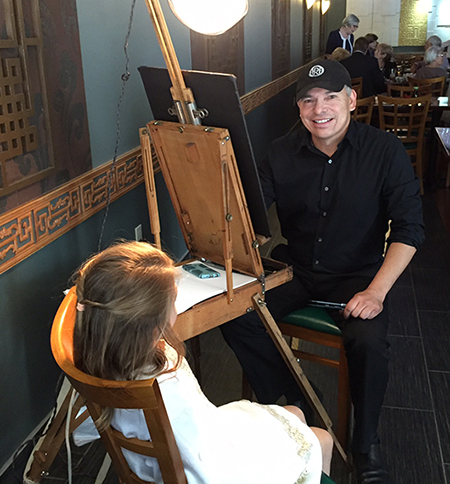 Mark “Gootz” Gutierrez and Laura Schoppa have been drawing – at live events and gift caricatures – for over 20 years. 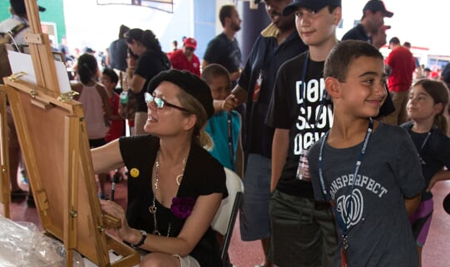 With a solid foundation in cartooning and ability to achieve quick likenesses, they – and other members of their team – are often booked for events in the Washington DC area. SketchfacesDC is based in Alexandria, Virginia. Visit our blog, Instagram feed or Facebook page to check out recent work! Laura says: “I don’t exaggerate as much as I ‘cartoonify’ my subjects!” Laura has been drawing caricatures for over 20 years. Laura spent her childhood in Japan, California and Texas. Like Mark, she started drawing as a kid, and one of her biggest inspirations is MAD’s Tom Richmond. She attended Washington University in St. Louis with a concentration in illustration and graphic design and earned a Bachelors of Fine Art. Laura is energized by practicing her craft and strives to continue to evolve as an artist.